Ar̲ivuccelvam / [el̲utiyavar] Kō. Pūvarākan̲. Cen̲n̲ai : Vān̲ati Patippakam, . From the University of Chicago Library. அறிவுச் செல்வம் Arivuselvan (?) by கோ. பூவராகன் Ko. Poovaragan. Google translates this title as “Wealth of Knowledge”. What an intense cover illustration! This definitely screams its era, mid-1960s! Here’s a bit of info about the origin and culture of the paisley pattern, btw. 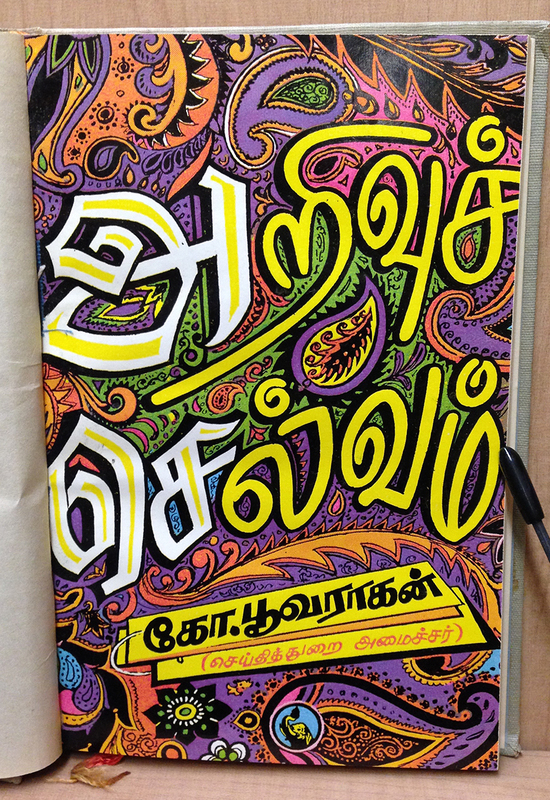 Also note that the author’s name is written on a representation of the palm-leaf manuscripts of Southern India.